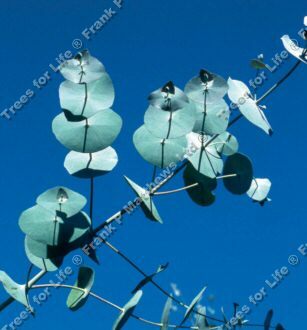 The Spinning Gum Tree (Eucalyptus perriniana) is a very unusual and exotic tree. A Native to Tasmanina, it is known as the spinning gum because of its interesting young foliage that encircles the stems. As the tree ages they dry up and break free from the growth point still encircling the stem and "spin" in the wind and thus its name. Its bark on the main trunk has a somewhat mottled cinnamon colour as distinct from silver or grey. An additional attraction is the sweet fragrance of the flowers, likened to burnt cinnamon. Bees in particular are attracted to this.